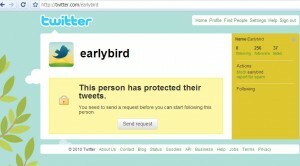 Twitter To Make Money With Earlybird? There is no doubt about the phenomenal rise of Twitter. The recent infographic we posted is but one testament to that. For many Twitter users, it has been somewhat of a blessing that the service has been free for four years now. While it doesn’t seem likely that they will start charging everyone to use Twitter, it is but time for the service to start generating considerable revenue for itself. And, it looks like that’s exactly where they are headed. 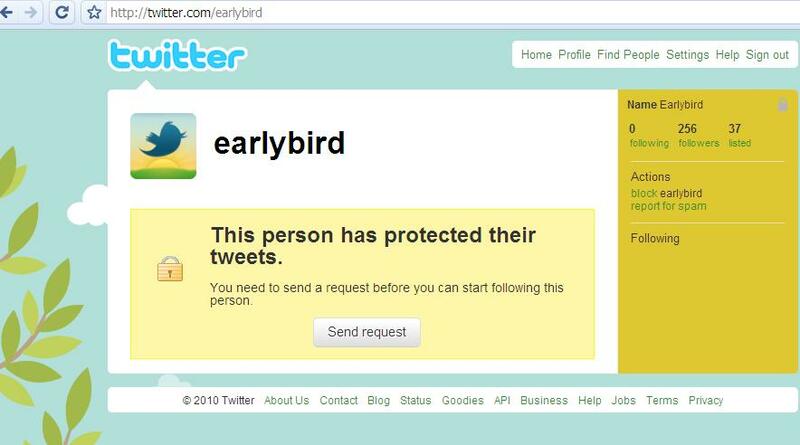 If you noticed about two weeks, a new account called Earlybird was launched. Yesterday, it was opened up to followers. No one knows much about it, but speculation is rife that this is the beginnings of Twitter’s campaign to make money. To matters more mysterious, Earlybird’s tweets are private, leading people to think that it is going to be a channel for good deals and exclusive stuff from outside retailers. So what do we know? It’s gonna be interesting. We need to wake up early. We’re being led by a carrot on the proverbial stick. We’ll keep watch and wait anyway.